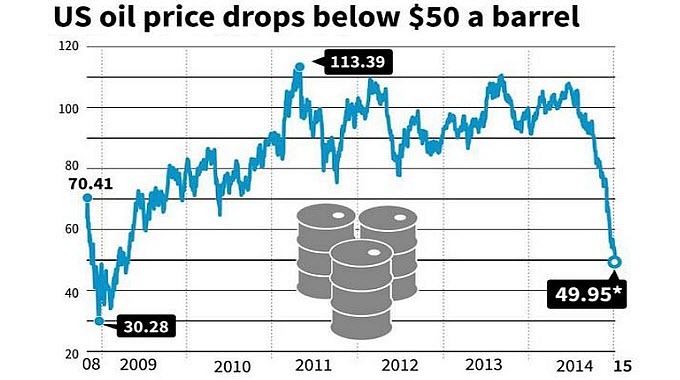 On Monday, the price of oil fell below $50 for the first time since April 2009, and the Dow dropped 331 points. Meanwhile, the stock market declines over in Europe were even larger on a percentage basis, and the euro sank to a fresh nine year low on concerns that the anti-austerity Syriza party will be victorious in the upcoming election in Greece. These are precisely the kinds of things that we would expect to see happen if a global financial crash was coming in 2015. Just prior to the financial crisis of 2008, the price of oil collapsed, prices for industrial commodities got crushed and the U.S. dollar soared relative to other currencies. All of those things are happening again. And yet somehow many analysts are still convinced that things will be different this time. And I agree that things will indeed be “different” this time. When this crisis fully erupts, it will make 2008 look like a Sunday picnic. Another thing that usually happens when financial markets begin to unravel is that they get really choppy. There are big ups and big downs, and that is exactly what we have witnessed since October. So don’t expect the markets just to go in one direction. In fact, it would not be a surprise if the Dow went up by 300 or 400 points tomorrow. During the initial stages of a financial crash, there are always certain days when the markets absolutely soar. For example, did you know that the three largest single day stock market advances in history were right in the middle of the financial crash of 2008? Here are the dates and the amount the Dow rose each of those days… October 13th, 2008: +936 points October 28th, 2008: +889 points November 13th, 2008: +552 points Just looking at those three days, you would assume that the fall of 2008 was the greatest time ever for stocks. But instead, it was the worst financial crash that we have seen since the days of the Great Depression. So don’t get fooled by the volatility. Choppy markets are almost always a sign of big trouble ahead. Calm waters usually mean that the markets are going up. In order to avoid a major financial crisis in the near future, we desperately need the price of oil to rebound in a substantial way. Unfortunately, it does not look like that is going to happen any time soon. There is just way too much oil being produced right now. The following is an excerpt from a recent CNBC article… The Morgan Stanley strategists say there are new reports of unsold West and North African cargoes, with much of the oil moving into storage. They also note that new supply has entered the global market with additional exports coming from Russia and Iraq, which is reportedly seeing production rising to new highs. Since June, the price of oil has plummeted close to 55 percent. If the price of oil stays where it is right now, we are going to see large numbers of small producers go out of business, the U.S. economy will lose millions of jobs, billions of dollars of junk bonds will go bad and trillions of dollars of derivatives will be in jeopardy. And the lower the price of oil goes, the worse our problems are going to get. That is why it is so alarming that some analysts are now predicting that the price of oil could hit $40 later this month… Some traders appeared certain that U.S. crude will hit the $40 region later in the week if weekly oil inventory numbers for the United States on Wednesday show another supply build. ‘We’re headed for a four-handle,’ said Tariq Zahir, managing member at Tyche Capital Advisors in Laurel Hollow in New York. ‘Maybe not today, but I’m sure when you get the inventory numbers that come out this week, we definitely will.’ Open interest for $40-$50 strike puts in U.S. crude have risen several fold since the start of December, while $20-$30 puts for June 2015 have traded, said Stephen Schork, editor of Pennsylvania-based The Schork Report. The only way that the price of oil has a chance to move back up significantly is if global production slows down. But instead, production just continues to increase in the short-term thanks to projects that were already in the works. As a result, analysts from Morgan Stanley say that the oil glut is only going to intensify… Morgan Stanley analysts said new production will continue to ramp up at a number of fields in Brazil, West Africa, Canada and in the U.S. Gulf of Mexico as well as U.S. shale production. Also, the potential framework agreement with Iran could mean more Iranian oil on the market. Yes, lower oil prices mean that we get to pay less for gasoline when we fill up our vehicles. But as I have written about previously, anyone that believes that lower oil prices are good for the U.S. economy or for the global economy as a whole is crazy. And these sentiments were echoed recently by Jeff Gundlach… “Oil is incredibly important right now. If oil falls to around $40 a barrel then I think the yield on ten year treasury note is going to 1%. I hope it does not go to $40 because then something is very, very wrong with the world, not just the economy. The geopolitical consequences could be – to put it bluntly – terrifying.“ If the price of oil does not recover, we are going to see massive financial problems all over the planet and the geopolitical stress that this will create will be unbelievable. To expand on this point, I want to share an excerpt from a recent Zero Hedge article. As you can see, a rapid rise or fall in the price of oil almost always correlates with a major global crisis of some sort… Large and rapid rises and falls in the price of crude oil have correlated oddly strongly with major geopolitical and economic crisis across the globe. Whether driven by problems for oil exporters or oil importers, the ‘difference this time’ is that, thanks to central bank largesse, money flows faster than ever and everything is more tightly coupled with that flow. Oil Crisis Chart - Zero Hedge So is the 45% YoY drop in oil prices about to ’cause’ contagion risk concerns for the world? And without a doubt, we are overdue for another stock market crisis. Between December 31st, 1996 and March 24th, 2000 the S&P 500 rose 106 percent. Then the dotcom bubble burst and it fell by 49 percent. Between October 9th, 2002 and October 9th, 2007 the S&P 500 rose 101 percent. But then that bubble burst and it fell by 57 percent. Between March 9th, 2009 and December 31st, 2014 the S&P 500 rose an astounding 204 percent. When this bubble bursts, how far will it fall this time?